“Stroke” can occur in a young person, in this case a 20 year old woman. She had an undiagnosed vascular disease and hypertension. 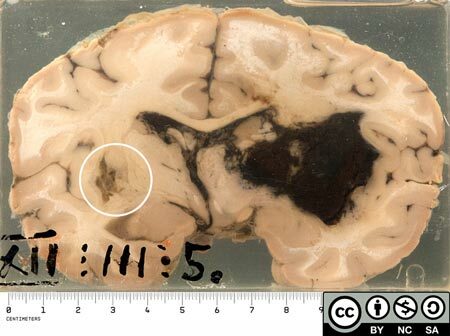 This is a coronal slice from the parietal region of her brain. 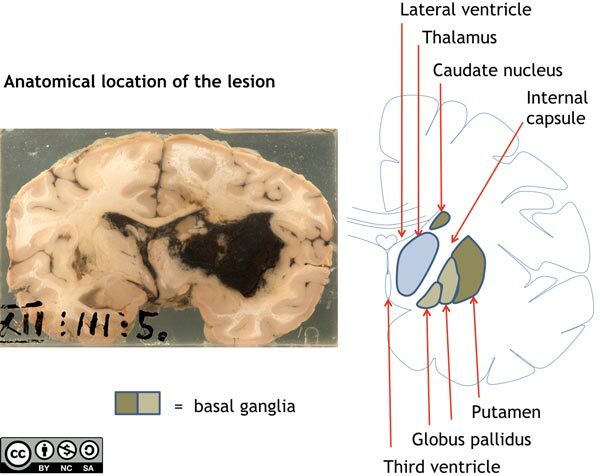 There is a large right sided haemorrhage in the region of the basal ganglia, specifically the putamen, which is the commonest site for hypertensive haemorrhage. and midline structures are displaced to the left. A year before her death the patient had a right-sided hemiparetic attack, which resolved completely. On the left side of the specimen in the region of the putamen there is a cystic lesion with brownish discolouration. This is the scar of a previous cerebral haemorrhage, which probably accounts for that episode. Hypertension causes abnormalities in vessel walls. In the brain, the small penetrating arterioles are affected. The changes include lipohyalinosis and fibrinoid necrosis, which weakens the arteriolar walls. Minute aneurysms (Charcot-Bouchard aneurysms) are often formed. The arterioles are vulnerable to rupture. In this case a rupture has occurred in one of the penetrating lenticulostriate branches of the middle cerebral artery. Other common sites for hypertensive bleeds are the thalamus, pons and cerebellar hemispheres.